On An Overgrown Path: Who's afraid of the big bad wordsmith? Who's afraid of the big bad wordsmith? 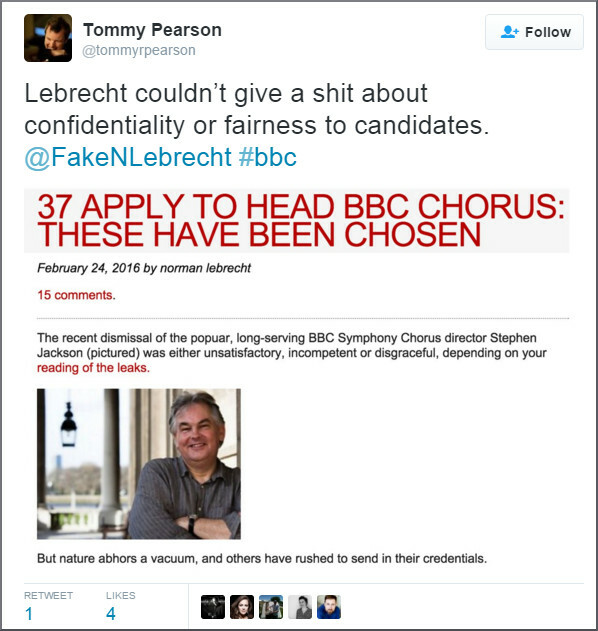 Kudos to Tommy Pearson and Simon Toyne for speaking out against Norman Lebrecht's irresponsible publication of the candidate shortlist for the directorship of the BBC Symphony Chorus. Following an outcry this Slipped Disc 'exclusive' was subsequently deleted without explanation, and without public apology to the candidates whose careers may have been compromised by this audience-whoring indiscretion. I am now waiting for reaction to Lebrecht's impropriety from the industry PR executives and other attention seekers who feed him with the oxygen of exclusives, and the reaction of his erstwhile employer the BBC. I also await comment from his colleagues in the UK music bloggers' mutual admiration society, and from the rest of the classical music establishment. But I am not holding my breath. Why so bitter about 'the UK music bloggers' mutual admiration society'? I can only really think of one to whom you might refer, and there aren't that many anyway - you are one of them, after all. And this WAS irresponsible, but it's been drawn attention to. Now, how about more from you on the ENO Chorus? David, not bitter. Just pointing out that there is a mutual admiration society of bloggers, who are notably reluctant to take a stand against irresponsible journalism. I may be a UK blogger, but I am certainly not part of that charmed circle, as this post attests. I write about things which I have some knowledge of, and which - more importantly - I feel passionately about. I have little detailed knowledge of the very complex problems at English National Opera, and therefore am leaving that subject to others who may - or possibly may not - know more about it than me. One of the biggest problems with social media is that everyone has an opinion about everything, even if that opinion just reheats the views of others. Dōgen Zenji, the founder of Sōtō Zen, had it so right when he said: "Think three times before speaking and then choose to speak only in one out of ten of those instances". Fair enough, but who are they? As I wrote, I can think of one very self-satisfied blogger but I don't know of links to others. Maybe I'm just not in that charmed circle, and long may it remain so. The situation at ENO is complex in terms of how to find a solution, but not at all complex in the attempt to deprive 40 or so singing professionals of three months of their salary per annum. That's just morally wrong in my view. David, for every self-satisfied person there is a circle around them feeding that self-satisfaction. Apropos ENO, do not forget that for every complex problem there is an answer that is simple and wrong. What is sad about this thread is that all this talk diverts the attention from the real culprit Lebrecht, who will continue to enjoy the largesse of the classical music industry while peddling his shoddy brand of churnalism. Yes, the culling of the ENO chorus is a tragedy. But classical music needs to get its house in order at all levels - it is not just 'the management' that is to blame for the increasing instability. Let's move on now please; we've both had our say and I see early signs of that curse of blogging, the circular argument, appearing.